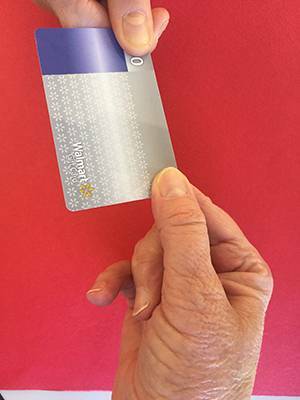 $50 Walmart Gift Card—Could It be Yours? It sure could be! For your chance to win, all you have to do is tell us the nicest thing a student, parent, or colleague has done for you this school year. Then we’ll do something nice in return: we’ll randomly draw one lucky teacher to win that gift card! Submit your comment to this blog by 11:59 pm EDT on May 30, 2017. Good luck! The good deeds don’t end there; check out this week’s assortment of freebies and fun stuff sure to make you smile. 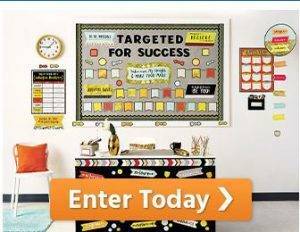 Win the classroom of your dreams! Three lucky teachers receive a Carson Dellosa shopping spree and a Visa gift card. Click here to get the details. Bloxels is running a sweepstakes too. 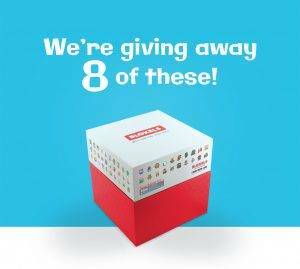 Eight educators will win a Bloxels Team Builder 5-Pack. To enter, create an activity that uses Bloxels and submit it to contest.bloxelsbuilder.com. Learn more here. Pitsco wants to help you create a makerspace. Visit Pitsco.com/MakerGiveaway for a chance to win the Invention Explore-a-Pak Maker Project, the SunEzoon Maker Project, or the AP Bottle Racer Maker Project. Enter now. Lots to win this week, so good luck! PS: Here’s one more: School Zone is giving away a $1,000+ prize pack full of School Zone learning materials and goodies from Zoobooks and The Pencil Grip. Three teachers will win. Click here or visit SchoolZone.com/teachersweepstakes2017. The nicest thing I had done for me this year was receiving individual notes from students telling me how much my class benefited them. I have a parent that continually sends kind words and emails about tells me all about her daughter’s great school year and all the wonderful things her daughter shares and tells about school. I have a parent that has been so appreciative of her child’s experience. She is always sending little notes or gifts that she has made with her child. It has been such a fun surprise! My students created book marks with personal messages to me. The nicest thing parents and students do is always the notes of appreciation they give me or post on Facebook for me! I had to have minor surgery and missed two days of school. When I returned, the parents had organized a ‘meal train’ for my family. Each day students delivered an entree, a salad, dessert, and a few healthy snacks. At the time I had young children at home and my husband traveled a lot for work – so this was a HUGE lifesaver…. the looks on the students faces when they delivered a lasagna, a pan of brownies, a salad, or whatever it was … plus all of the homemade Get Well cards … PRICELESS. Such a kind and caring group of students and parents. I felt like royalty. One of my colleagues posted a picture of us together on Facebook after a 12 year absence of seeing each other. Many friends we worked with 12 years ago also responded with wonderful comments. Even though we live and work at different locations, we are planning to meet for lunch in the near future. The nicest thing I had done for me this year was a student & his parent telling me they were grateful for my support and belief in the student and all I had done for the student in & out of school. The Orf parents (of Gabrielle and Brynley) never miss an opportunity to say “thank you” for teaching their children. Two simple words which mean so much! I received a deck of cards that said “52 Reasons Why I like You!” On each card was a different reason. It was really sweet! The greatest thing a parent can do is be involved. It takes a team! The nicest thing a parent has done is help me with the book fairs. The nicest thing a colleague has done is tell others how much I help the students. Is does a lot to be recognized for what you do. My colleagues went above and beyond for me this year. I had cancer surgery, and they brought food to me and my family, flowers, cards, calls, and constant reminders of how much they cared. This meant so much! My one student brought me a bag full of assorted King sized candy bars to help me work my second job. I received cards from my students and from the parents,a bouquet of flowers, many gifts and gift cards and a couple took my husband and myself out to dinner at a great restaurant. It’s wonderful to have a heart of APPRECIATION. I received many thoughtful cards and flowers from some of my parents as an appreciation for what I do for their child. Our school secretary surprises me with a specialty tea every now and then! I love tea!! A 3rd-grade student I was tutoring wrote me a note and told me how much she enjoyed having me as a teacher. It really made me feel good, like I was making a difference. I had a student’s mom hand make gorgeous paper flowers for each team member that works with her son. I partner teacher stepped in to help me with our Math Field Day team after the regular teacher had to take time off to care for her husband who had a stroke. I love when people step up and help out. The nicest thing a parent has ever done for me is telling me that I have made a difference in their child’s life as they were growing up. This is from a parent whose child I taught 26 years ago. One student brought me gifts every day during teacher appreciation week. Birdfeeders, seed, gift cards, tshirts. Each gift had special tags attached to them, such as, thank you for “feeding” me the knowledge I need to succeed attached to the bird seed. Just hearing thank you is great! I save all of my thank you cards from students. I never tire of looking at them. My kids gave me hugs! Smile and give hugs!! Some days those mean the most! The nicest thing a parent has done for me is by being so encouraging. This moms little girl is a toddler now but she still stops by every morning to say good morning and ask how I’m doing. She always tells us how much she appreciates every thing we do. She thanks us for helping her to feel like she can do this mom thing. I would rather hear the kind words any day over gifts. For teacher appreciation week, the parents had all of our kindergartners fill out a paper that was “All About My Teacher”. It included favorite memories of the year, their favorite thing about me, “what my teacher always says”, etc. The parents made it into a book for me. So sweet! I went for a routine Dr. check and was sent to the hospital to have my daugther a month early! My coteacher took my class room from P.E and set up everything so I could skype my students from the hospital and tell them I was okay and I would see them after Christmas. Our parents made us breakfast, each family donated $20 and each day we received gifts enjoyed deserts, lunch and more! They really helped make it a special week! I had a Kindergarten student tell me she loved coming to school because I was a great teacher! She said she was nervous about school when she started, but I made her feel better and she loves coming to school! I had the nicest thank you note from a parent…one of those bring you to tears kind of messages. It was exactly what I needed to hear at the time. I was out with friends and unexpectantly ran in to a family of a former student ( year prior). This has been a tough year for me, but the parents have been wonderful! All the gifts are very much appreciated, but it is their words of encouragement and support that mean the most to me! After taking a shopping trip with one of my students at our school’s book fair, she brought me a baggie of loose change from her piggy bank with a precious thank you note – first grade! Melted my heart! I broke my leg this year and had to miss the last few weeks of school. The nicest thing that my students did was make get well cards for me expressing how much they would miss me. During Teacher appreciation week I received so many nice things. Chocolate, flowers, gift cards. thank you pictures. So much kindness from my families this year. One thing as a teacher that made me feel so special this year was a parent posting on Facebook about her son learning to read. This made me feel so proud as a teacher and grateful that I was a part of this wonderful achievement. A special thing about my year has been sharing my students, classroom and enthusiasm for education with a bright and upcoming teacher. Student teachers are amazing! The nicest thing a student has done for me this year was from a former student. He was on campus and when I greeted him, he reminded his mom that I was his 1st grade teacher and was one of his favorite teacher. It was so rewarding know that I made an influence in his life. Scott Clark, my teaching partner for 7 years, was the nicest thing that happened to me this year. It has been an honor this year to have worked with him from August until February 7th. Unfortunately he was killed, while running through a cross walk, by a drunk driver. The joy that he brought to our staff, students, and parents is deeply missed. He was a caring teacher who connected with his students and his staff. This horrible incident is a clear reminder to make each count and tell your friends at work how much you appreciate them and love your students! Oh my, Kristine, I’m so sorry. As I near the end of my teaching career, I had a ‘full circle’ moment happen this year. One of my new kindergarten students, it turns out, is the daughter of a girl I taught in kindergarten in a school across the city in my very first year of teaching, some twenty four years ago!!! What are the chances!?! When the surprising reunion occurred with the mom at our orientation meeting, she burst into tears, saying that she was just SO happy that her child would have me as HER first teacher! Now that, Charlie Brown, is what teaching is all about!!! After my brother passed away suddenly, one of my pre-k students made me a special heart box with a painted seashell in it to cheer me up. It was so thoughtful and sweet. The children and parents in my 2’s class are phenomenal. The nicest comment this year came from a dad at our parent/teacher conference. He said camping outside from 2 am – 7 am on a freezing January night to register for my class was well worth it. The nicest thing done this year was a parent who has health concerns making tie dye shirts for the whole class for our spirit day. We were the best dressed class in the school! A parent in my class sends me nice surprises about once a month. Always with a note complimenting my abilities. I feel so special! The nicest thing that happened to me this year was a former student returning to say hello! It was amazing to see her after 3 years. She and her grandmother were driving past the school and asked to pop in and see Ms. Laura! Also our director threw an awesome teacher appreciation week for us! It was a “Movie star ” theme! What an awesome week! One of the other teachers on my team spoke to a newspaper reporter about how she was part of the “dream team”-(and we are quite spread apart in age-I could be her mother). They ended up doing an article about the 3 of us working together. It made me feel good about the comments I got from parents, students, and staff at our school. One student that moved away this year sent me a gift at the end of the year; just to let me know that I’m appreciated and being thought about with good wishes. I had a great parent volunteer this year. He helped with classroom organization and went on a field trip. Just having him in the classroom helped to tone down some of the behaviors. I miss him, but am so glad I was able to be there for the family when they suddenly lost him over spring break. I teach preschool in my home. One student I’ve had for two years now and love his whole family. Recently a large cast iron bell that had been in my family since my father was little was given to me but I did not have a stand for it. The parent of the little boy I’ve had for two years made me one and wouldn’t take any money for it! He could have easily charged me $100 or more for the beautiful stand he made. Yesterday was our last day of school with a class I had for 2 years. A real quiet girl told me before we left, ” I cried last night because school is over”. The nicest thing that happened to me this year was my para educator let me know she enjoyed working with me​ and would like to work with me again next year. I felt very appreciative that she chose to work with me again. I would love to share this with her. I had to stay an hour late with a student because she got stuck in really bad traffic. The next day she sent a note thanking me and apologizing along with a Starbucks card. I had a student that had a very challenging year in Kindergarten. It was a challenge for everyone- the student, his peers, his family, the principal, and myself. We got things ironed out within the last month of school. On the last day of school I received a very motivational garden gift basket. Included was a card with a very heartfelt message thanking me for my help and patience throughout the year. They’ll always hold a special place in my heart and I now have several reminders that anything is possible when you work together! The nicest thing you can receive as a teacher is the love and support of the family and community around you. One of the sweetest things a student did for me this year was buy me a container of salt. I had brought a hard boiled egg and no one had salt that I could put on it. So she brought me a container of salt the next week. One of the nicest things done for me this year was by a colleague. I am teaching a summer school class called “Get into Nature” in a couple weeks. With the deadline approaching for kids to sign up, the office lady who takes care of registration stopped me the other day. She told me that she just let in one more student over the class limit. The student happens to be her nephew. The nephew told her that he really wanted to be in my “Nature” class again this year. He went on to tell her that “if he needed another dad, he (me) would be his choice”. I’ve had that student in this particular summer school class for a couple years in a row now. First of all, this class is my passion! This boy saying that about me really made my day! The nicest thing at my school is our phenomenal PTA. Their efforts to raise money, create stage sets, help with bullentin boards, and appreciate all staff is over the top ! I had a parent bring me lunch from a new restaurant in town! It was so unexpected and just made my day! I have a couple of things to say about my students and their generosity. This past January I broke my leg and was out of school for 12 weeks. During that time I received cards and letters from each of my students. They were the kindest letters and I will cherish them for years to come. I am now back at school on a walker. I have to move my chair to the front of the class each time I go to the whiteboard to teach, I only have one rolling chair. My students are falling over themselves to move my chair for me before I even say anything. They are now aware of their surroundings as well, especially when it comes to having book bags on the floor. They are great at reminding their peers to pick up there belongings so that I will not trip and fall. So with that, I can say all of my students have been outstanding citizens this year. I have a very loving class this year and have been treated with kind notes and art work. These small gestures make everything else worthwhile! I had a mom tell me “you have no idea the impact you are having on my child.” Appreciation from a parent is the best gift – right behind happy, healthy students. My heart is full! The nicest thing a parent did for me was boost my confidence. She told another staff member that she never worries about her child when I’m present. Knowing a family is secure leaving their precious child in my care is one of the most important parts of the job to me. The nicest thing done for me this year was by parents. I couldn’t believe how many told me face-to-face or emailed a thank you for helping their child have a wonderful year in first grade. This was my 27th year teaching, and I just return to first grade after teaching seventh grade Reading for nine years. (I needed to take a little break!) ??? ?